My father was in the airline business so as a child our vacations always involved first-class air travel, exotic locations and 5-star hotels. Looking back now I am so grateful for the opportunities I had and the wonderful memories. I remember waiting on our front porch in the Somerton section of Northeast Philadelphia for my parents to gather my younger siblings and our luggage. Dressed in my best Sunday dress and those darn pinching Mary Jane shoes I watched several of our neighbors getting ready to leave on their vacations. They all had station wagons and were all headed ‘down the shore.’ The kids were dressed in their Ked’s and shorts and looked so happy as they packed picnic baskets, beach toys and towels into the back of their cars. I thought they were so lucky. That is probably why I love Doo Wop music and the Jersey Shore so much today! Once my aunt and uncle purchased a home in Ocean City I was lucky enough to visit. My grandmother was the one that usually took us and what fun that drive was. My cousins and I would beg her to keep pushing the buttons on the radio until our favorite songs would come on. We would wind down the windows and sing as loud as we could. Whenever I hear Doo Wop music my mind immediately floods with memories of the Jersey Shore. We are now sharing our shore memories and making new ones with our grandchildren and introducing them to our favorite summertime music. Today I would like to introduce you to (if you don’t already know him) Philly ‘Cuzz’ Battaglia. Philadelphia has launched many talented performers and Cuzz is definitely on that list. He is a songwriter, pianist, singer and producer. He is introducing Doo Wop to a national audience and when my grandkids love it I know it’s cool again! His first album, Philly Cuzz and the Shoobies was a hot seller in seashore giftshops and DJ’s started playing his versions of On the Way to Cape May and Down by the Ocean. Be sure to follow him on social media to be treated to some great memories and some new original music. You are talented and could perform anything, why this music? In 1997 my neighbor and Temple University guitar teacher, Anthony Ferrara, turned me on to new recording technologies. I had been a songwriter since I was a teenager. 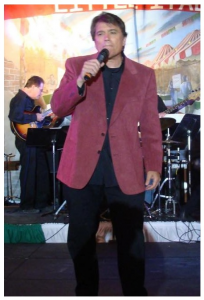 At 16, I wrote a tune that Junior Pirollo – lead singer of the vintage doo wop group the Four Js – recorded. The song is called “Girl I’m Sorry” and is credited to a studio group called Kristin Shore. Sirius XM’s Doo Wop Stop plays it because Junior is the vocalist. Prior to me discovering digital recording devices, I wrote with no specific market in mind. Sometimes I’d compose a classical Christmas suite or write a jingle – like the South Philly Geno’s Steaks theme heard in the 80s. In short, because of new musical toys, I created my own recording studio. I played piano for many country clubs in the 90s. Then in 98, the Windrift Hotel in Avalon hired me, and that’s when a certain tune written by Maurice “Buddy” Nugent got my attention. 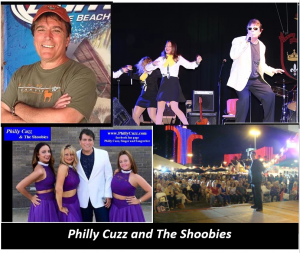 The song was special to a certain demographic, which the residents of the Jersey beach towns called: “Shoobies.” It was “On The Way To Cape May”, a local summer anthem done by Cozy Morley, and then later by Al Alberts. It seemed to bond the shoobies – i.e. vacationers – together. So, I decided to make a “next generation” recording and make it sound like a Bobby Darin swing tune. That first step caused me to think of other selections that could appeal to shoobies, especially the baby-boomers. I put together a new version of the Rascals’, “A Beautiful Morning”, and I included a forgotten doo wop ditty titled “Down by The Ocean”. I also wrote some originals. “A Shoobie Family at The Seashore” was one and that title alone generated interest. Radio talk show host Dom Giordano mentioned it on the air and later the Philadelphia Inquirer elaborated on the lyrics. Soon enough, the Atlantic City Press spotlighted me in an article saying, “He gives Rocky Balboa a run for Philadelphian authenticity. The main difference is that Philly Cuzz is real.” That was neat. I called the first album On The Way To Cape May with Philly Cuzz and The Shoobies. Designed for three generations traveling to the seashore in the family car, it became a South Jersey hit. And that was with zero airplay. Beach shops like Della’s 5&10 and Love the Cook in Cape May kept restocking their shelves. These days I often hear moms tell me that when their kids were young, this CD was their car music to the shore. I’m honored. Eventually, the Philadelphia Sunday Inquirer gave the album a front-page story on Labor Day Weekend back in 2001. The article revealed a secret weapon on my marketing team. She was a tenacious, energetic record promoter who discovered her talent in sales at the age of 78. She got me in chain stores, Barnes and Noble, Borders, Sam Goody and even the Seashore Ace Hardware store in Stone Harbor. The record promoter was my mom, a very important and dear shoobie to me. For our national friends, explain exactly how the term ‘Shoobie’ came about. What made you delve more into doo wop? When my second album came out – American Seashore Days – I’d say that doo wop fans adopted me because of one special ballad. And that ballad launched me into Las Vegas. I asked my friend Nick Fanelli to write a tune. Nick is one of those musicians who turns into Peter Pan when it comes to songwriting. “All children except one grow up.” The studio becomes Neverland, and that’s the way it should be. You should never lose your young soul when recording. The studio is the place where the musician has the power to take listeners on a magical adventure. I gave Nick some direction. Write a love song, perhaps like Chad and Jeremy’s “A Summer Song”. Think summer. A few weeks later he came over with an original called “One Summer Night”. I immediately thought the name might be confusing because of the Danleers’ same title hit. When I listened, his concept echoed an early Platters arrangement with piano chords tapping 6/8 time in the high register. I also noticed something simple, catchy and worthwhile. Ingredients for an arrangement quickly surfaced in my mind. I took notes: 1) strum the guitar like the Beatles’ “This Boy”, 2) strings, perhaps, like Percy Faith’s “A Summer Place”, 3) harmonize like street corner singers in the early 60s. In hindsight, one of the most desired goals for a recording artist is to make a hit summer tune. In our niche market, without the help of big corporation muscle, we somehow achieved that goal. The recording gets some stellar compliments. It’s one thing to read that a person likes your song. It’s something else when fans say it’s one of the best doo wop ballads ever. In 2006 I was featured at the Cool Bobby B Las Vegas Doo Wop Convention with the Tokens, the Planotones and the Tymes (a vocal group I played piano for in the 70s). In 2007 I returned appearing with the Capris and more. Since then, I perform in Las Vegas two weeks a year. I’m still growing up in South Philly. Other than that, the neighbors will kill you for a parking spot, South Philly is the best. And now I’m getting all these young people moving in. One couple came from Haddonfield. Another guy played football for LSU. The retired teacher across the street is my age and moved in from Swarthmore. Ron is my very first South Philly “Quaker” buddy and claims to be 1% Italian. Guess what? One percent goes a long way. So, we go to Victor’s Café, listen to opera and eat Pesto Tortellini. I teach him things that Italian guys – even one percenters – should know, like: hand language, how to be loud, where Jimmy Hoffa is buried, the name of the cheese is pronounced MOOZT-a-rella. Mom was the piano teacher of the neighborhood. Her brother – Vincent “Jimmy Saunders” La Spada – was and early South Philly recording star. Along with having his own radio show (a very big deal in those days), he also wrote songs recorded by Vic Damone, Rosemary Clooney and Frank Sinatra. In fact, when Frank Sinatra left the Harry James band, Uncle Jim took his place as lead singer. Mom would tell us stories of her pre-teen years, of her coming down to the kitchen and finding grandma making lunch for her son and Harry James. Another day it was Johnny Desmond or Joe Venuti (the father of jazz violin) in the kitchen. This all took place above my grandpop Philip’s Bakery. Mom and her brother influenced me a lot. As for dad, he was my biggest promoter. I still sing on stages he acquired for me years ago. I play keyboards. On a recording these days that can be anything from the piano sound to the bass, a choir, just about anything one hears in a production. Sometimes a real harmonica pops up in the arrangement. That’s me. Occasionally I use my son Mike on piano, guitar or mandolin. My wife sings background on several productions like “The Summer Kids from Ireland” and “We Are the Red Hat Society”. And Nick Fanelli plays guitar at times. Growing up; who did you listen to? Our home was full of musical variety. Records included the usual gang – Sinatra, Tony Bennett, Mario Lanza – but my dad also liked Hank Williams. His army buddies from the south would visit and I’d be listening to “Jambalaya” or Patsy Cline. The first time I sang on stage was at the corner bar. I was seven and did Dion’s “Teenager in Love” with the band. At age 11, you’d find me singing lead with the older guys across from Pat’s Steaks. I remember belting “There Goes My Baby” by the Drifters. A great song. In Bishop Neumann High School, I became the school pianist freshman year. That involved learning a Broadway musical each spring, and playing for the choir. Thank you, Father Bart Agar music director. Back then, I also went to the Settlement Music School which was all about classical music and learning theory. Music arrangers became special to me. My friends knew all the stats about baseball players. I knew who wrote a song and arranged a record. I especially liked Arif Mardin and his work with the Rascals. Mardin did “Natural Woman” for Aretha Franklin and the Hall and Oates single “She Gone”. He is an amazing figure in the history of pop music. In retrospect, I realize that one of the biggest heroes of my youth was a Turkish Muslim immigrant. He came to the US because he loved American music. Next time you hear the Rascals “A Beautiful Morning”, Chaka Khan’s “I Feel For You”, Bette Midler’s “Wind Beneath My Wings”, remember Arif Mardin arranged them. Around this time my mom played lots of Peter Nero albums too. Then in Temple University’s music collage, I discovered the genius of Stravinsky. What is your oldest Jersey Shore memory? How old were you and where? The lyrics to my song “Josephine” answers this question. “Bright as the beach the first time you see it, you came from sunshine above.” I remember how bright the edge of the world gradually became as my dad drove into a beach town. I must have been about three sitting in the back, peeking ahead. It’s one of those things that, as adults, we take for granted. But moving closer to the sea, I recall the vast brightness. I also remember my parents co-renting a bayside house in West Wildwood with my aunts and uncles. Good memories with the cousins. Aunt Lucy ended up buying a house next door to Bobby Rydell’s parents. I have pictures of Bobby and my brother playing football on Montgomery Avenue back in 1968. What is your favorite boardwalk food? 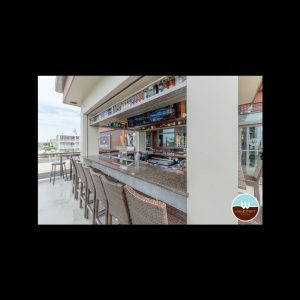 What is your favorite boardwalk drink? Game? Ride? Are you still writing songs? If so what are you working on? What TV show would we be surprised to hear you watch? 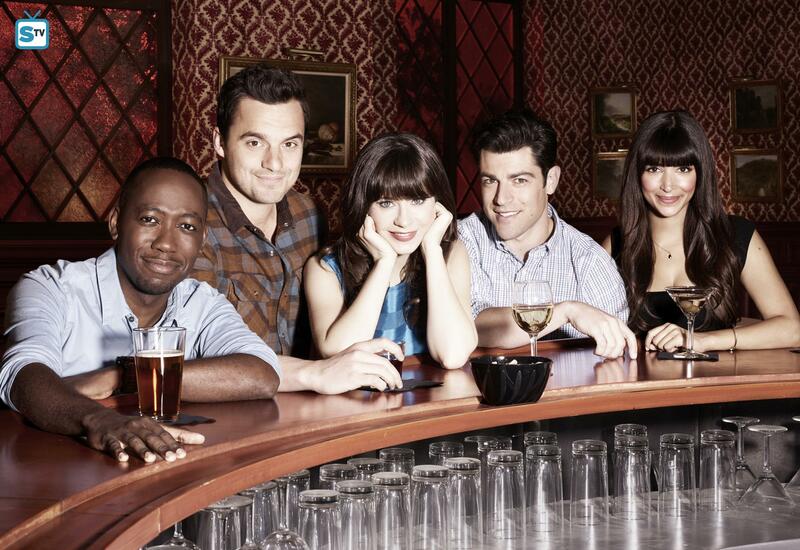 New Girl. The Zooey Deschanel character – Jess – reminds me so much of my wife at that age. And my wife, like Jess, is also a school teacher. For my birthday, I had my three sons over and we watched “Dumb and Dumber To”. It was great fun belly laughing together. My wife has no idea why we like the film. Favorite alcoholic drink? Nonalcoholic drink? I’m not much of an alcohol drinker these days. But when I do have a beer, it’s probably a Yuengling or a dark beer. As for non-alcoholic drinks? I’ve been having grapefruit juice in the morning. The last concert you attended as a fan? Steely Dan. For you Dan fans out there who love their song Deacon Blues, but have no idea what the lyrics are about, here’s the gist. Imagine you’re a young man who wants to be a musician – “learn to work the saxophone” – but your distressed parents cringe at the idea. They badger you to be a doctor, a lawyer, anything else. The singer addresses this conflict defiantly. That’s about it. In a movie about the Jersey Shore what character would you play? What decade would be featured? Where can we find more information on you, your shows and where can we buy your music? You can go to my web site via www.OnTheWayToCapeMay.com or www.PhillyCuzz.com. There you will find links to my songs posted on YouTube and links to online venders, such as, iTunes, CD Baby and more. Scroll down the top page of the web site and several of my instrumentals can be heard. 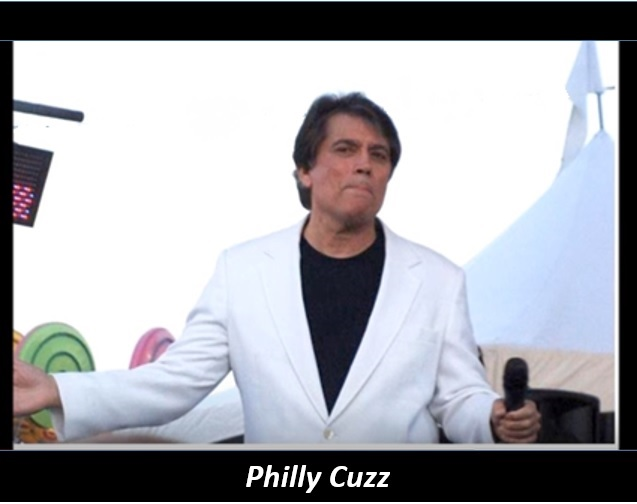 On Facebook a fan made a group page for me called Philly Cuzz, Singer and Songwriter. Everyone is invited to join. Also, Spotify offers my music. You can see me May 10th to 14th 2017 at the 38th Annual Las Vegas San Gennaro Feast. It’s one of the town’s largest outdoor festivals. On June 23, 24 and 25, I host the North Wildwood, NJ, Italian American Festival. Most of my schedule involves private parties. I frequently sing and DJ for high school reunions. And just about every afternoon I perform in nursing homes and retirement communities across the Delaware Valley. Philly Cuzz Bataglia is a very talented and wonderful person! God bless him always…. and his Bella la famiglia! Summers down the shore were so much fun. When I hear this music it brings back lots of happy memories. It is great how you spotlight so many diff genres of music. I grew up in the southwest……..far from the Jersey Shore. However, I do love this kind of music……….it is so fun and danceable. This is such a cool interview. I didn’t grow up with the Jersey shore either. Love that you also got to travel the world. It’s fun to combine experiences. Well that was fun! 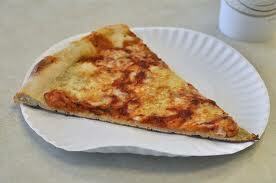 His music is so ‘the shore’ to me as well, not to mention Mack (& Manko’s…poor Manko) Pizza. My mom is also my best marketer. I gave her ‘salesperson of the month’ last month! Hahaha. What a fun guy and fun music to boot! I took piano as a child and didn’t keep it up. That is one major regret.